Today eMarketer published an article highlighting how top brand marketers are looking to invest “big” in social media in the coming years. The article was based on a survey conducted this summer by consultancy Booz & Co. and Page management software Buddy Media. Just how “big” are Fortune 100 companies across the globe investing in social? 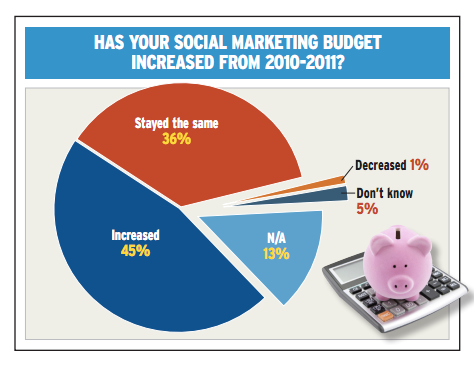 Two-thirds report that social media made up less than 5% of their total digital spend in 2011. In three years, a third expect that number to rise to up to 10% of budgets, 27% predict it rising to 10-20% of their budgets, and an additional 28% report it will make up more than 20% of their budgets. These companies plan to spend that increased budget on hiring employees (57%), leveraging technology vendors (48%), and investing in more social media buys (38%). Chief Marketer’s 2011 Social Marketing Survey found that 73% of marketers incorporate social into their campaigns — up from 64% last year — and 45% report that their social budgets grew between 2010 and 2011. As for their channel of choice, 91% of those who reported running social marketing campaigns did so on Facebook, either by way of ads, Apps or Pages. Digital Trends highlighted a survey conducted by Busted Coverage that shows 79% of people can’t go an entire day without logging in to Facebook. (40% check in on the social network before they even brush their teeth in the morning!) Earlier this month Digital Trends highlighted an article around how nearly 300,000 status updates, over 500,000 comments and 140,000 photos are posted to Facebook every minute. Social Times published an infographic yesterday illustrating how social advertising is reaching new heights. The infographic underscored that 85% of companies are currently involved in social advertising or plan to be within the next year. Facebook (“surprise! surprise!”) is dominating the social advertising landscape, with 93% of marketers using social advertising deploying campaigns on the social network. 60% of these marketers believe social ads will be “very valuable” for their companies’ bottom lines over the next two years. Efficient Frontier published a report based on their marketing platform activity which suggests that Facebook’s social ad revenue grew 54% in Q3 over Q2. They also estimate that Facebook’s user engagement has increased by 31% over the last year, mainly being driven by the Like button. Needless to say, social marketing is going nowhere but mainstream!